The United States Congress designated the Cottonwood Canyon Wilderness (map) in 2009 and it now has a total of 11,667 acres. All of this wilderness is located in Utah and is managed by the Bureau of Land Management. The Cottonwood Canyon Wilderness is bordered by the Cottonwood Forest Wilderness to the north. Cottonwood Canyon Wilderness lies within the Red Cliffs National Conservation Area and shares a common boundary with the Cottonwood Forest Wilderness, located on the Dixie National Forest. Here, massive blocks of Jurassic age Navajo Sandstone have been eroded by wind and water, leaving rounded domes and numerous small canyons. The resulting landscape is both austere and intimate, affording outstanding opportunities for solitude and natural quiet, just minutes away from the major population centers of Washington County. Convenient trail access makes this Wilderness a popular choice for hikers and equestrians. 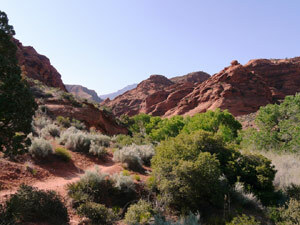 There is a total of 20 miles of trail in Cottonwood Canyon Wilderness. Although it is at the western edge of the Colorado Plateau, the Cottonwood Canyon Wilderness supports plant and animals species that typify the arid Mojave Desert. Since temperatures can exceed 100 degrees Fahrenheit in the summer (temperatures are more moderate in spring and fall), well adapted plants, such as pockets of desert shrubs, cover the sand dunes and rocky outcrops of this wilderness. Mojave Desert species, such as Utah agave, banana yucca, scrub oak, and single-leaf ash, are found in the lowlands (as low as 3,300 feet) and line the dry washes. At higher elevations (as high as 5,000 feet), pinyon pine and Utah juniper dot the rocky slopes of the Wilderness area. Mule deer, mountain lion, bobcat, and kit fox live here, as they do farther east on the Colorado Plateau. Mojave Desert species, including the federally-listed threatened Mojave Desert tortoise and the Gila monster and chuckwalla reptiles are also residents of the Cottonwood Canyon Wilderness. Golden eagles, red-tailed hawks, and the western screech owl circle the craggy canyons of this Wilderness area, searching for prey. On the right day, at the right time, lucky visitors may see bald eagles, peregrine falcons, and Cooper's and sharp-shinned hawks in the area. Cottonwood Canyon Wilderness receives between 16 and 19 inches of precipitation each year. Planning to Visit the Cottonwood Canyon Wilderness? How to follow the seven standard Leave No Trace principles differs in different parts of the country (desert vs. Rocky Mountains). Click on any of the principles listed below to learn more about how they apply in the Cottonwood Canyon Wilderness.